May 1903. Sunbeam 10-12 h.p. with T. C. Pullinger. 1894 Birth of his first daughter Dorothee Pullinger. 1902 Travelled to the United States to observe car factory design and the mass production methods in Detroit. 1907 Joined Arrol-Johnston, as the manager of their Paisley works. 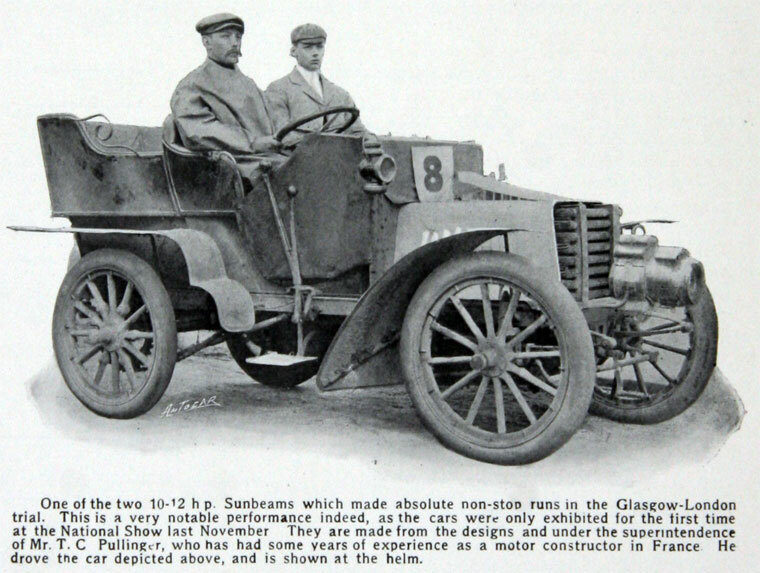 1910 Helped his daughter Dorothee to gain her first job in the automotive field with Arrol-Johnston. 1913 Directed the construction of a multi-storeyed glass and ferro-concrete factory for Arrol-Johnston at Heathhall, Dumfries. It was the first such factory in the United Kingdom, and embodied some of the new ideas he had seen in the USA. The First World War began before the factory was in full production, and the company switched from manufacturing automobiles to producing aero-engines for the Ministry of Munitions. 1916 Oversaw the construction of a second modern "daylight" factory for Arrol-Johnston near Kirkcudbright. The factory was conceived of not just as a munitions factory staffed by women for the duration of the war, but as an engineering college for the female staff. The company aimed to attract educated young women, and set up a structured apprenticeship system to train women who wished to take up engineering as a profession while producing aero-engine components for the Heathhall works. This page was last edited on 12 September 2017, at 17:36.